The Windows 8 secure boot system, and UEFI in general, are still a headache when it comes to booting Linux. Although Ubuntu has supported the secure boot for several versions now, it still poses problems when installing, reinstalling, or customizing the boot process. 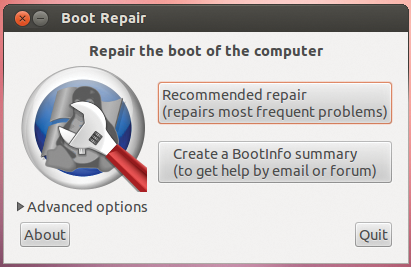 Because of this, Ubuntu 14.04 will come with a Boot Repair  app preinstalled. Boot Repair aims to be a very simple tool that will allow you to mend most boot messes with a click of a button. Most of the time, boots can be mended by reinstalling GRUB to the Master Boot Record (MBR), which is what Boot Repair does in its simplest form. The software will also help you back up table partitions, backup bootsectors, create a Boot-Info report (to get help by email or from a forum), or change the default repair parameters: configure GRUB, add kernel options (acpi=off …), purge GRUB, change the default OS, restore a Windows-compatible MBR, repair a broken filesystem, specify the disk where GRUB should be installed, and so on. You can already grab Boot Repair by downloading the source  and compiling it yourself, or by including the PPA  in your list of repositories. Be warned that Boot Repair is still under development, and you should use it at your own risk. Well, not exactly. Although Canonical honchos promised Ubuntu Phones for the first quarter of 2014, the only people who will be getting them will probably be developers. Ubuntu's Community Manager, Jono Bacon, speaking on a Reddit AMA (Ask Me Anything) admitted that "Longer-term we would love to see the major OEM/Carriers shipping Ubuntu handsets. This is a long road though with many components, and I would be surprised if we see anything like this before 2015" . Currently, your only choice is to use the Touch installer if you want to try Ubuntu on your phone. Even then, you may be in for a disappointment. As Bacon pointed out, there are only a handful of experimental demo apps for the system, and developers will not be supporting the new Nexus 5 handset, and they are also dropping support for the original Nexus 7 and the Nexus 10. This leaves only Nexus 4 and the 2013 version of the Nexus 7 as officially supported. If you have one of those devices, you can get the installer from . Everybody else will just have to wait. Jono Bacon, Ubuntu Community Manager, recorded a short demonstration of the current state of Unity. Jono talks about the newest member of the Ubuntu family. Jono explains what's going on behind the scenes at Ubuntu on the desktop, mobile devices, and the cloud and how the community fits into the grand plan. Jono shares what's inside Ubuntu's latest Long-Term Support release.